Luxurious velvet ribbon is a collection subtle antiquing is spun onto solid wood, collectable spools. Velvet ribbon is sure to add texture and beauty to gifts and bouquets as well as adding pops of color to decor.Each batch is hand dyed so color is subject to variation. 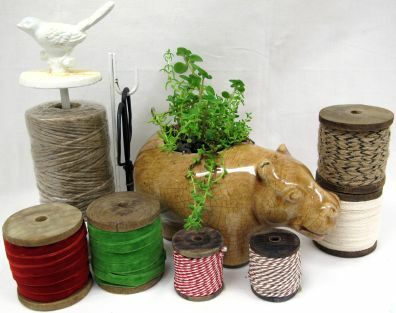 The Jute and the string are great to have around the home. Copyright © 2016 Twigs Home & Garden. All Rights Reserved.